The irony is that while battlecruisers are gone, they are still with us today. Battlecruisers were eggshells armed with hammers, which exactly describes modern warships. Today’s combat vessels mount weapons of staggering lethality, especially anti-ship missiles. They also defend themselves with cannons and missiles to shoot down incoming weapons with a technological finesse that would have seemed like an H.G. Wells novel to a sailor in 1914. “There seems to be something wrong with our bloody ships today,” said Admiral Beatty as he watched his battlecruisers blow up one by one at the Battle of Jutland. It wasn’t supposed to work that way when Britain’s Grand Fleet encountered Imperial Germany’s High Seas Fleet off the Jutland peninsula of Denmark on May 31, 1916. Battlecruisers were meant to be a solution to a problem, not a problem themselves. Compare the Royal Navy’s Queen Elizabeth-class battleships and the Renown-class battlecruisers, which fought in both World Wars I and II; they were both armed with fifteen-inch guns, but the battleships had a top speed of twenty-four knots, while the battlecruisers could zip along at thirty-one knots. The consequences became evident at Jutland when three of seven British battlecruisers blew up, the victims of direct hits from German battlecruisers. Another notorious example is HMS Hood, which also exploded after a fifteen-inch shell from the German battleship Bismarck apparently plunged through the thin deck armor and detonated the magazine. Not surprisingly, most battlecruisers never made it to old age. Several were converted to aircraft carriers between World War I and II, including the USS Lexington and Saratoga. Many others were sunk, including Japan’s Kirishima and Hiei at Guadalcanal (the Kirishima was dispatched by the U.S. battleship Washington), while HMS Repulse was sunk off Malaya in December 1941. What went wrong? And was the problem with the ships or with the way they were used? In some cases, the issue does seem more tactical than technical. British doctrine in World War I emphasized smothering the enemy with rapid broadsides, even at the expense of safe ammunition handling procedures. 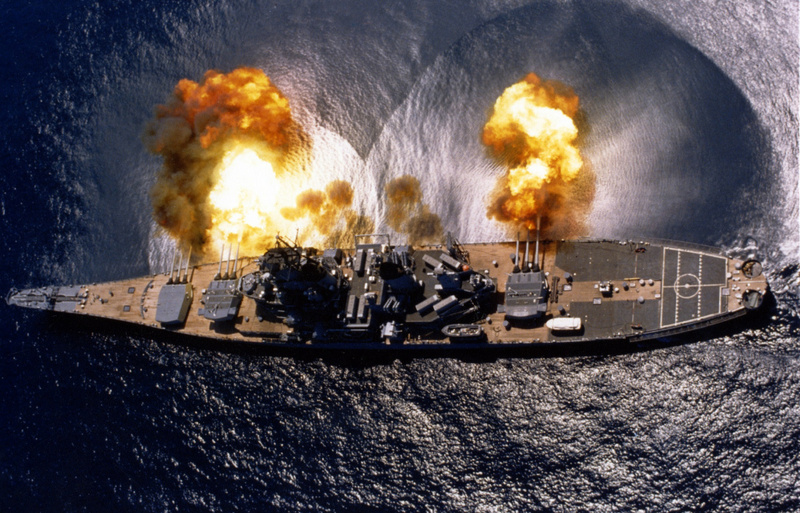 This made British warships more vulnerable to ammunition explosions. Indeed, it is worth noting that the German battlecruiser squadron came under fire from most of the British battleship contingent, but most of them managed — albeit badly battered — to reach port. Clearly, superior German ship design and tough Krupp steel made a difference. The battlecruiser concept seemed flawed from the start. Like many hybrids, they suffered from an identity crisis. Should they be used like battleships in big fleet actions, or more like cruisers, to detect and harass the enemy, and then step out the way while the big boys slugged it out? At Jutland and the Denmark Strait, they were deployed like capital ships, where they proved too fragile (though for an alternate view, see here). It’s a question that still plagues weapons design and employment. Is a $150 million F-35 supposed to be used as a fighter capable of dogfighting? A strike aircraft that will stand off and launch air-to-ground missiles? Or will it come in low into the teeth of enemy air defenses as a close support aircraft? But what if a missile hits them? Just one hit, as we saw with HMS Sheffield and USS Stark, can sink or cripple a ship. Even if it doesn’t sink, the sensors, computers and electronics would likely be so fried or jostled that the ship would effectively be incapacitated. True, there have been improvements in materials and damage control. But in the end, a modern warship dishes out a lot more firepower than it can take. That doesn’t mean we need to build an Aegis cruiser with the armor of the battleship USS New Jersey. The way the arms race works, it’s easier for the enemy to design a more powerful ship-killer than it is to keep bulking up on armor that will only make a vessel heavier and more maintenance-intensive. This first appeared in 2015 and is being reposted due to reader interest.